Last year I ran a series of speedtests on both AT&T and Verizon Wireless LTE during CES, the results of which were pretty interesting. 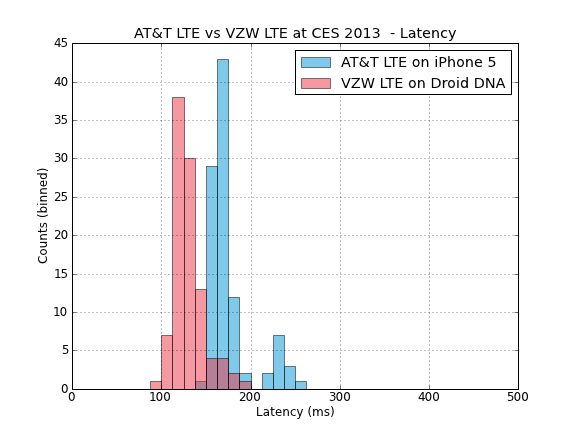 My friends continue to poke fun at how obsessive I am with running speed tests, and this year I decided to do the same experiment during CES 2013 by carrying around an iPhone 5 on AT&T LTE and HTC Droid DNA on Verizon Wireless LTE and running speedtests at the same time and place periodically on the two handsets side by side. The places I tested are pretty much indicative of your average tech journalist's in Las Vegas for CES — I ran a few in my hotel (LVH), inside and throughout the LVCC North and South halls' show floors and concourses, the Venetian, Mandalay Bay, Palms, and a smattering of the Las Vegas Strip itself. Most of the major hotels have DASes inside them (Distributed Antenna System or sometimes Digital Antenna System). I know for a fact that at least the Palms and Venetian have DASes, as does the strip itself. Inside the LVCC there are multiple DASes, with at least three different systems visible that I managed to spy. Spotting these indoor systems is almost always a challenge, as they're camouflaged intentionally to both dissuade vandalism or theft, and also for aesthetic reasons. Even if you know what you're looking for they're at best difficult to spot or out of sight and sometimes completely camouflaged. That said, I snapped photos of the ones I was pretty confident were in fact DAS antennas and put them in a gallery. 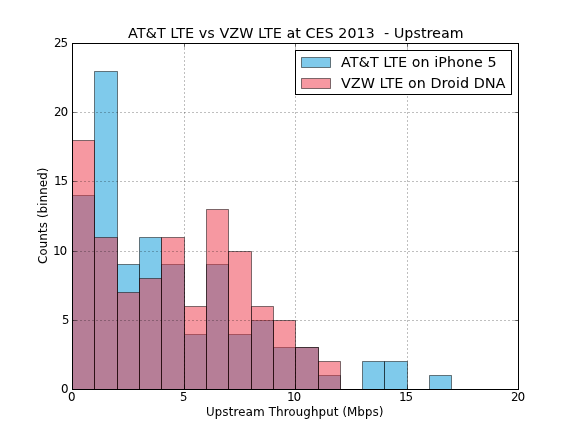 So how did AT&T and Verizon fare at CES 2013? First, I should note that both Verizon and AT&T were best I can tell only using their 700 MHz spectrum assets, that means band 13 for VZW and band 17 on AT&T with 10 MHz of bandwidth. I didn't see Band 4 on the iPhone 5, and the DNA (and all new HTC devices) lacked Field Test or similar engineering menus that would enable me to check, but it lacks band 4 anyways. I ran 100 speedtests on both devices at the same places during my day (and night) at and around the show. Both were to the Switch Communications server in Las Vegas, for consistency of host. I then used my same script to create some histograms of the results, and stats. 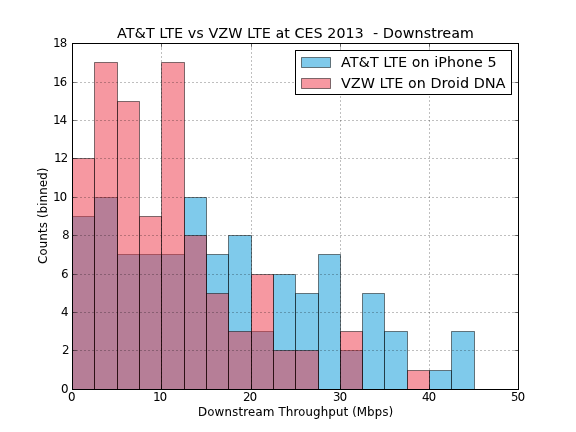 When it comes to downstream throughput, it seems as though AT&T edged out Verizon Wireless for CES 2013, with AT&T bringing in an average of 16.7 Mbps compared to Verizon's 10.6 Mbps. On upstream, AT&T hits 4.4 Mbps, Verizon hit a slightly higher 4.7 Mbps. Latency is a bit more interesting, with Verizon having lower average latency at 130.1 ms, and AT&T coming in at 175 ms, but I suspect this is more a story about the different routing that each takes both through the ePC (Evolved Packet Core) and onto the internet and then test server. Both operators did pretty well during the show, all things considered. Upstream took a huge beating and varied wildly depending on how close you were to a base station and how many people there were around you, but tweeting, checking emails, and downloading the latest schedule at least worked. I will say that although AT&T had better downstream throughput at the end of the day, on the whole Verizon's coverage profile continues to be much better. In the Mandalay Bay I lost AT&T connectivity quite a bit and suspect the building either doesn't have a DAS or AT&T isn't hooked into it, whereas Verizon was solid. 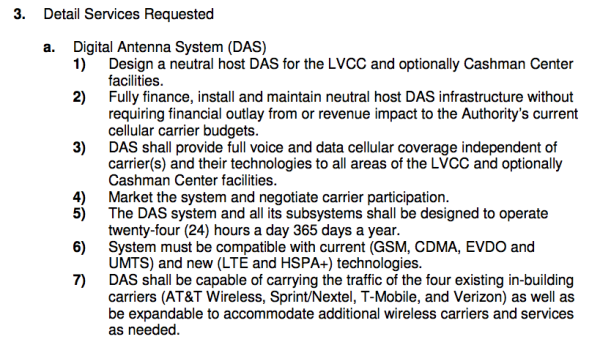 Inside the LVCC both operators understandably had great coverage. I have to hand it to both major operators for keeping their LTE networks up at the show floor. 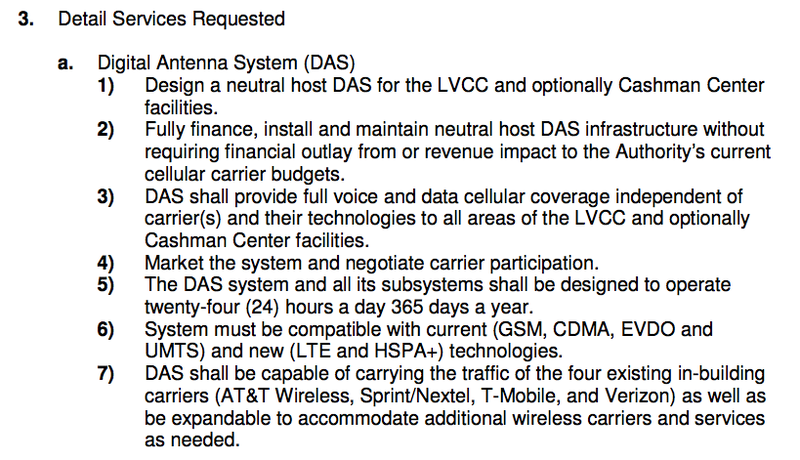 I remember before Verizon or AT&T deployed LTE having limited to no connectivity in Las Vegas, much less inside LVCC during CES, and this seems to now largely be a thing of the past. I have always thought that LTE will bring at least better latency. Comparing to T-Mobile HSPA+ network, I don't see any advantage besides peek downstream (I've seen T-Mobile getting 35 and it does average above 10 in urban areas, latency 150-250). Latency is the biggest factor of slowing you down on a mobile phone specially when browsing. Well, I also completely disagree with your premise that latency is more important than bandwidth/CPU in mobile right now. I spend way more time waiting for the page to load after the connection to the site is made than I do waiting for the load to start. In fact, if it went farther there could be less hops and, thus, lower latency. Because of the way wireless networks have to schedule access, it means that latency will go up as the number of users increase. "I have always thought that LTE will bring at least better latency." That's because you get your understanding of cell technology from idiots. What is the difference between LTE and HSPA? One uses OFDM and the other uses WCDMA to modulate the signal onto a carrier. That is the ONLY essential difference. Everything else can be (and is) used by both technologies. 16QAM or 64 QAM. Both can use. Better FEC, or fancier HARQ. Both can use. Various MIMO or frequency combining techniques? Both can use. And specific to this: routing of how packets get from the radio-head to the internet proper can use exactly the same techniques (eg RRH, ePC). The difference between OFDM and WCDMA is that WCDMA is about 84% as peak efficient as LTE, and it's harder to hit peak efficiency with WCDMA because you need a fancier and fancier equalizer, whereas you can exploit the match between OFDM technology and the way physics degrades a signal to much more easily tailor an optimal signal to the path between the mobile and the tower. THAT's what all the arguing is about: 84% and better eq's !